On Saturday, I had the honor of speaking at the NSCAA Convention, presenting what I’d put together toward my Single-Digit Soccer book, sharing ideas, and making bad jokes about my youth team being named Athens Applejacks. In case you couldn’t make it — or in case you weren’t writing things down — here’s a synopsis. It may even have some things I forgot to mention. U.S. Youth Soccer will also post slides later. 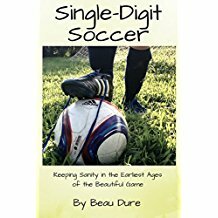 Single-Digit Soccer is an exploration of issues, a guidebook for parents, a collection of fun stories and so forth — all in the U-Little age groups (U10, U9, etc.). 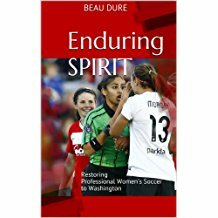 The book will come out sometime this year, but I’m still seeking input. Please chime in and let me know what you think. 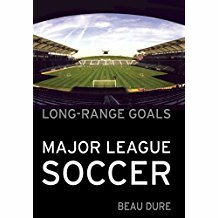 USA TODAY, Long-Range Goals, Enduring Spirit (if you’re on this blog, you already know I can be found here). My youth soccer work started in earnest when I covered the unveiling of the U.S. Soccer curriculum for ESPN.com. Yes, I was the starting sweeper for the U14 Athens Applejacks 1970. As a player, it’s been all downhill from there, and I recently retired from indoor soccer goalkeeping because my hand didn’t recover from a couple of saves. As a coach, I’ve been involved with House league, All-Stars and a “crossover” program in which our U7s and U8s sign up for extra training and play against teams from other clubs. I have an “E” license and will get my “D” this year. There’s a chasm between what we say and what we do. U.S. Youth Soccer says we shouldn’t have competitive tournaments, tryouts or a split between “recreational” and “competitive” at U10. Then we have U9 State Cups. We worry about kids not having enough fun, getting too serious too soon, and then quitting. So at U9, we’re telling kids they’re not good enough. You don’t get to train with the great coach. You don’t get the fancy warmups. You can’t play in a tournament. Then we tell other 8-year-olds they’re hot stuff. These kids strut around school like they own the place. “Hi, Coach Beau! I’m really good — I made travel!” Then coaches wonder why these kids aren’t devoted to improving themselves. It’s like Nuke Laloosh with the quadraphonic Blaupunkt. And it trickles down even lower. U8 ID Days. U6-U10 Tryouts. And if your club isn’t doing these hyperserious things, the club next door is. In our “crossover” league, we took 48 kids who just signed up, split them into four teams and took them into games against teams that had tryouts for the top 12 players. It was House players who signed up for additional training vs. a travel team in everything but name. The idea here is to frame the discussion. Some of these issues don’t have simple solutions. Some are just things to weigh in the balance when making any sort of decision about soccer — how to set up a club, how to coach, what parents should look for, etc. Big issue, especially for parents. Travel teams can easily cost $1,000 per season not inclusive of tournament fees, uniforms, postgame stops at McDonald’s, etc. And one elite league in my area has a four-hour, 35-minute drive between clubs. For a league game. Again, see that travel distance. Now all these other commitments. Welcome to the U9 Academy, where you’ll spend three days a week training for your 30-35 games in a 10-month span. Not that simple. Some are chasing college scholarships. Most just want their kids to do something fun and healthy. Some hope their kids can play high school soccer. Some hope their kids get the social experience of playing travel soccer with other kids who love the sport. And some don’t want to drive more than five minutes to practice. Probably not. That’s what orthopedists and psychiatrists would say. But parents are terrified of their kids being left behind. Or they play indoor soccer in the winter because they get something different from that than they get from their house leagues — they can play with their buddies. The big one. Entire rooms at NSCAA tackle this issue. And we all say development. Are you rotating everyone on defense and in goal? Are you selecting only small numbers of players, like some teams do in our crossover and All-Star tournaments? Are you teaching your players to foul, dive and do other acts of wanton gamesmanship? I saw it at a U9 tournament. Some kids are content playing “Mr. Wolf, What Time is It?” Some want to play actual soccer. And then there’s the whole notion of keeping score. A lot of kids want to do it. How many of your clubs have time set apart for free play, where kids can come in and play in mixed groups with parents and coaches told to shut the bleep up? We say the game is the best teacher. We warn against joystick coaching. Is that message getting across? A program near me has three training sessions for every game at U8 — the games are every other week, and they just play other kids in the program. I can’t think of a kid I’ve coached, and I’ve coached some very good ones, who would enjoy that. Kids like to play with their friends. Some groups of friends have greater interest in and aptitude for soccer than others. So the typical house league might bust them up. Fair? Perhaps. Fun for all? Maybe not. Are there other ways this house league could be fair without splitting up all the groups of friends? Are unevenly matched games a good challenge? Or a waste of time? Do “A” players need to train apart from “B” players? Will it drag down the “A” players to be around other kids? Should we ban them from playing at recess with their buddies? And what’s an “A” player at age 8 anyway? Can we do it differently, perhaps putting everyone in one pool and only pulling them out for voluntary extra training and merit-based tournaments? Are we burning these kids out? Mentally and physically? This part will work best when you can see the slides. I list the issues on one side of each slide, and I highlight the ones that are addressed by each idea. These are not Commandments. These are discussion-starters. Some of them actually contradict each other. Some may make sense for one club and not another, depending on your geography, your schools, your staffing, etc. By all means, try to follow a curriculum, but meet reality at some point. Your curriculum may tell you to do a completely different set of exercises each week, but your kids may not have that kind of attention span. The kids I coach usually don’t, and I can’t spend half of every practice explaining the new exercises. This is actually happening — through NSCAA, U.S. Soccer, AYSO and others. That’s great. We need to train parent coaches, and they can’t always drive 90 minutes for two weekends a year to get a “D” license. We’re asking them to volunteer as soccer coaches, not join the Army Reserve. We need to make what we say match what we do. I’m not sure how. Maybe just talk to your parents. The trouble is that if you don’t offer something, they may sign up for a program somewhere else. But we can encourage kids to do other things. Basketball will help teach team tactics. Swimming will keep them fit. Martial arts can teach discipline. Chess, music, acting — everything else will make them well-rounded people. That, moreso than a singular focus on soccer, will help kids at college admissions time. My first youth sports experience was at the Athens YMCA playing four sports a year, mostly under the guidance of football coaches. In football season, we ran plays. The coach could call “32,” and I knew it meant a running back was going run into the hole between me (the right guard) and the center. Then in the spring, we all played 11v11 soccer, and it wasn’t a total train wreck. One reason this is important: “Magnetball” can easily drive skilled kids out of soccer. They can’t get the ball, so they can’t use their skills. We ask parents to pick up their kids from school, take them home for an hour or three, then drive them back to a soccer field that might be right back at that school. Meanwhile, the local karate school is picking the kids up in a van. Parents who strain to make one soccer practice a week will gladly sign their kids up for five days of karate. It’s not because they’re chasing a karate scholarship. Some people in the audience objected because their geography demands such travel. That’s understandable. In the metro D.C. area, it seems ridiculous. This is what I see in our local baseball, and guess what? We produce a lot of good players without segregating people. The players all play Little League. A few of them also get “elite” play on a travel team that just plays a handful of games. Another idea borrowed from baseball. If you start playing at age 7, you don’t just get tossed in with U8s who have been playing for years. You’ll likely start at Rookie baseball while more experienced 7-year-olds play Single-A. People progress through the ranks at their own pace. By the time they’re 12, they’re all in the same league. Doesn’t that sound better than splitting into “recreational” and “competitive” at a tryout at age 8, with little opportunity to bridge the gap? Another idea for keeping late bloomers in the game and for rewarding players who are serious about soccer but can’t match the elite players’ athleticism. Ideally, give everyone who wants professional training and evenly matched competition the chance to get it – maybe not every day or every week, but at some point each season. The one thing of which I’m firmly convinced is that THIS is the ultimate goal for all of us who care about youth soccer. We need to meet the needs of elite players with good competition, at least on occasion. We need to meet the needs of those who are not elite yet but might be. We need TOPSoccer. We need basic rec league for people just starting out. We need to give all players a good time — these are our future soccer fans and our future youth club volunteers. Grouping by skill instead of age works in baseball because it is not a contact sport, and barely even a team sport, so the physical attributes of one player do not significantly affect the play of the other players. This is not true for soccer. For example: you never have a 9 year old charging at and smashing into a 7 year old who is trying to field a ground ball in baseball. That the third baseman is 3 years older and 30 pounds heavier than the batter does not affect the batters ability to hit. Next Next post: MLS and free agency: Fatal brinksmanship?